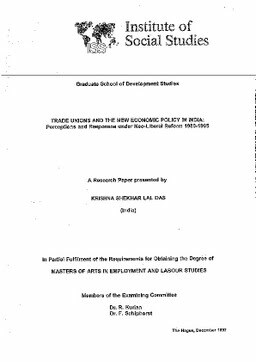 This paper focuses on the impact of liberalisation on employment and trade unions in India during the period of 1980 and 1995. Though liberalisationlnew economic policy affect various aspects of people's lives, given the scope of the paper I will limit around the issues of labour/employment and trade unions. The technical limitation of this paper is also being recognised, since much of the substantive matter related to liberali~ationlSAPINEP is strongly economic. While the very technical aspects of NEP/SAP may not be covered, the layman's analysis would be provided to argue the paper's main points. This paper is also constrained by limited data and literature that would assist with a more profound analysis, especially in relation to the Okhla industrial area.